← What Can We Say About President Obama’s Economic Performance in Early 2010? Is it useful to think of the Occupy movement more as a “left” movement or a “youth” movement? 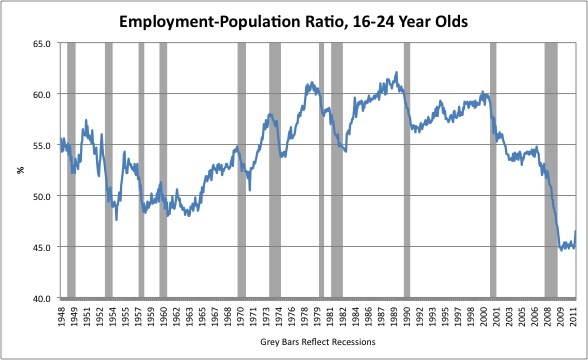 To answer that question, it’s worth looking into data on the young, particularly as it relates to unemployment. To leave the United States for a minute, one way people are trying to understand the Arab Spring is through the lens of mass youth unemployment and inequality. Given how high unemployment has been in these MENA – Middle-East and North African – countries, what else could we expect besides revolution? For instance, in early February then IMF chief Dominique Strauss-Kahn told a conference that “this summer I made a speech in Morocco about the question of youth employment including Egypt, Tunisia, saying it is a kind of time bomb” and “such a high level of unemployment, especially youth unemployment, and such a high level of inequality in the country create a social situation that may end in unrest.” Here is the “youth unemployment” blog tag at the IMF to give you a sense of what people there have been saying about it. In particular, they point out that it should be a major concern for the MENA and African regions. Part of you may want to immediately start getting your first-world privilege on. Maybe you are furious at terrible, unresponsive, corrupt governments ignoring the plights of their populations. Maybe you think that if these countries only had neoliberal, “flexible” wage contracts and a leakier safety net like we have in the United States then unemployment would be much better. 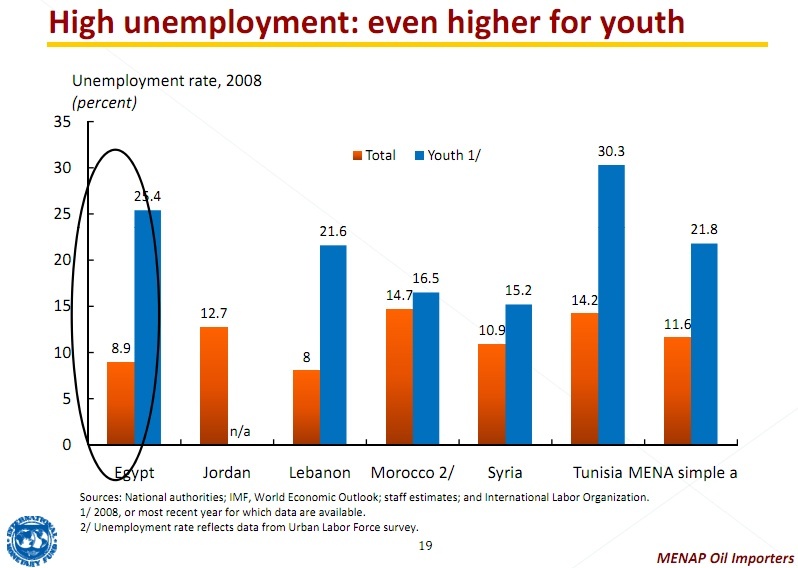 You may then head over to our monthly unemployment numbers and note that American youth unemployment is in the same ballpark as these MENA countries. Let’s get some data going. I’ve taken numbers from the IMF presentation slide above, and compared them to United States youth unemployment averages from January 2010 to October 2011 from the BLS’ CPS data. I can’t find what ages are used for youth for “youth unemployment” in the IMF’s definition, and I’m not even sure if it is consistent across the different countries they estimated. As such, I’m including ages 16-19 and ages 16-24, though I believe they are more likely looking at 16-24. 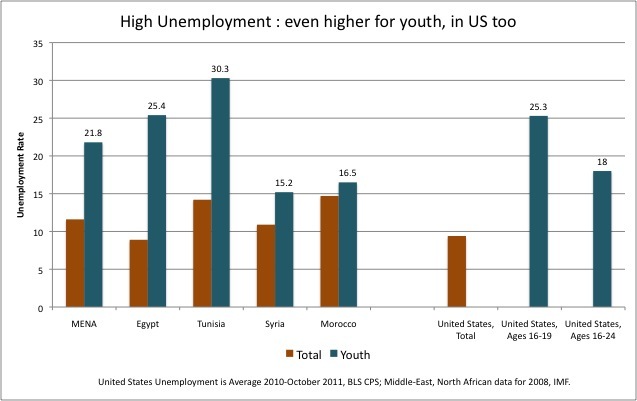 For 16-19, we are at the same level of youth unemployment for Egypt and well above the region as a whole. At the broader 16-24 range, we are above Syria and Morocco, which both saw large-scale movement in the Arab Spring. One potential explanation for the high level of youth unemployment in MENA countries is that they have huge demographic issues to deal with – they have a massive wave of people under 35 years of age to assimilate into their economics. What’s our excuse, other than confidence fairy terror spells and a desire to use the crisis as an excuse to go after public sector workers? Also, given this, how could we have ever said youth unemployment in the United States’ Lesser Depression isn’t a “time-bomb”? Remember the increase from the 1960s onward reflects women entering the labor force. And notice how it doesn’t improve after the early 2000s recession. Every age group has seen a substantial drop in the employment-population ratio during this Lesser Depression, but no other group I’ve seen comes close to this plummet. For the first time in half a century, a majority of young people aren’t working. Wow, that last graph shocked me too. It would actually be interesting to see the cross-national comparison of the youth EPOP ratios across countries–it’s often more reliable to compare employment than unemployment, given the difficulty of getting comparable definitions of the labor force across countries. Thanks for the great charts. I’ve got to assume that the last one reflects the fact, in part, that young people are staying in school longer because the labor market requires more education today to achieve the same quality of life as enjoyed in previous generations. Young people are staying school, because there are no jobs out there. They are not incurring more debt to gain more “skills,” but to have something to do while waiting for the job market to correct. I assume that these labor statistics are like any other employment statistic, and if someone is a full-time student, they are not considered part of the labor force. This is one time when it might be useful to look at numbers of unemployed youth (as a percent of all youth or the entire population). In the united states, we certainly don’t want our 16-18 year olds to be working (they should be finishing high school), and presumably a much larger percent of our 18-24 year olds are pursuing higher education than in less developed countries. Along with the demographics that you mentioned, this might be why our own revolution hasn’t started yet. confidence fairy terror spells – great usage, right up there with DeLong’s “ponyblogging” Maybe we could start calling them the “confidence fairy terrorists”? They’d be the “CFT” for short. Youth unemployment is, arguably, just one of the symptoms of deep structural problems in the US labor market. The unskilled-skilled ratio (chart below) and the long-term unemployed are at extreme levels relative to the past, suggesting that globalization, technology and the financial crash have transformed the US economy in ways that may permanently raise the unemployment rate (Okun’s Law intercept is pointing in this direction). In the link you say that the fall in unskilled employment could be a result a Stolper-Samuelson. Can’t be. Did international trade with LDCs suddenly rise? The great recession saw a huge fall in it. There’s something to say for the faster recovery in poorer countries, and in trade relative to GDP and employment at home, but S-S is a 1950s theory based on way too simplistic a theory of trade and has been repeatedly disproved in the data. That shows that regions with more industry-level competition with Chinese imports loose more employment. _Really_ interestingly, they also found that workers who were “displaced” were more likely to just leave the labor force than retrain or relocate. Did you notice that radical drop in 2006-08? That’s not structural, that’s economic catastrophe. Go after public-sector workers?? This is the most affluent set of workers that are sucking the blood from America and will eventually destroy us. Maybe you believe the government payroll should grow perpetually but the people who may taxes certainly don’t. Is this supposed to be a parody? This very site has a breakdown of who the top 1% are, and you can be assured they’re not government workers. As well, it also (if memory serves) also has a pay comparison broken down by education level that shows government workers, averaged, actually being paid less at higher levels of education than they would on average in the private sector. Yep, damn those bloodsucking irresponsible civil servants. All hail our prudent financial overlords who have so skillfully run our economy. Oh wait. Soldiers, cops, firefighters, and teachers are only hurting the American economy is the wildest dreams of teabaggers. Government work provides a comfortably middle-class existence, as it should. Remember a growing middle class? That thing we haven’t had since Clinton? Interesting. What always floors me about problems like these in labor markets is that they’re clearly the response of many people to decisions we make (or make through inaction) about the economy. It does not have to be this way. Some collection of actions made this happen. Even so, I think the most difficult problem of liberal politics is that there is no clear agency here. It’s like saying “the economy has problems” as a party platform. If blame is complex and diffuse, the only kind of opposition is almost entirely intellectual, not emotional. And that doesn’t work too well with American voters. In Spain (this is back in the mid- to late 90s, youth unemployment in Andalucia went up to age 40. That was presumably to keep the general unemployment rate in Andalucia from being even higher, by hiding all those 38 year old kids in the youth unemployment figures. I seem to recall it was a measure of those who had not had a job that lasted more than 6 months. We should be very concerned about this as this will add a big element of political instability over the long haul to our system of governance and business. Pllus many of the students will have huge unpaid school debts hanging over their heads, no job, no prospects. Either the top 1% is going to have to share a lot more, invest a lot more, and change the incentives from what they are now, or we will become a true third world country with rot from within. A house like that will not stand very long no matter how big the police state apparatus gets. You can kiss our freedom completely away and we will just be a mishmash of Oligarchies and armed security agencys floating around. Over half the people of *prime military age* not employed and not fed? This is the scenario which, historically, has overthrown governments *quickly*. Indeed! I’ve been swapping collateralized debt obligations since before Eugene Fama was born! A few things. Most of our 16-18 year olds are also in school. Not all of them need jobs at that point. Those who go to college might or might not need jobs but again, there’s another outlet there. A volunteer military is another for those who are fit enough. I’m not saying this to discount the problem, but to say there are more emergency valves in the US than in the other countries. The student loan scheme is killing the college “outlet”. The evisceration of welfare means many of the 16-18 year olds already do need jobs. The military… well, everyone knows how badly they’re being mistreated, in pointless foreign wars, *and* Republicans in Congress keeps attacking veterans’ benefits. The stupid people in power seem intent on eliminating the emergency valves which differentiate us from Zaire. As a 20-something American these days your options seem to be move to a large city, join the military, or stay in school. This is not a prescription for long-term growth. However, it does make for some pretty large-scale generational warfare. The baby-boomers got theirs, and now they’ve decided to pull up the ladders. I wonder what percentage of those kids are simply unemployable due to personality problems. I ask this as someone who spent several years in a position where I was privy to personnel issues in employment. Also, I had a girlfriend who was an HR consultant and the stories she told me of the antics of some of the employees were appalling, mainly, now some employees treated other employees. There are lots of people who are simply horrible individuals that no sane person wants to be around. No more than in any previous generation. Next stupid question? A more relevant indicator would be employment-population not enrolled in school. youth unemployment in southern Germany is about 3.5 %, wages good and rising. Its not like there aren’t jobs out there, I’m a 20 year old male from Massachusetts and I’ve gone from job to job over the past year and currently I work two administrative positions at a local medical group and work about 40-50 hours a week AND take 15 credits. Yeah, its difficult, but a lot of the unemployment rate comes from people being too lazy or elitist in regards to certain work. A lot of youth turn their nose working at fastfood, retail, restaurants, construction… Its ridiculous. All of those jobs make decent money for students in HS and in college. I did my time in retail, I did my time in the restaurant business. I have ALWAYS been able to find work, starting with the paper route I did from 7 years old to 13! The recession I think has been used beyond the point of being a valid excuse. For those unemployed with degrees and such and are unable to find work in your field, look elsewhere, being under employed is better than being unemployed, by far.